Included below is the schedule for the next two weeks. Bus and start times are listed. If missing a practice please remember to bring a signed note when you return. 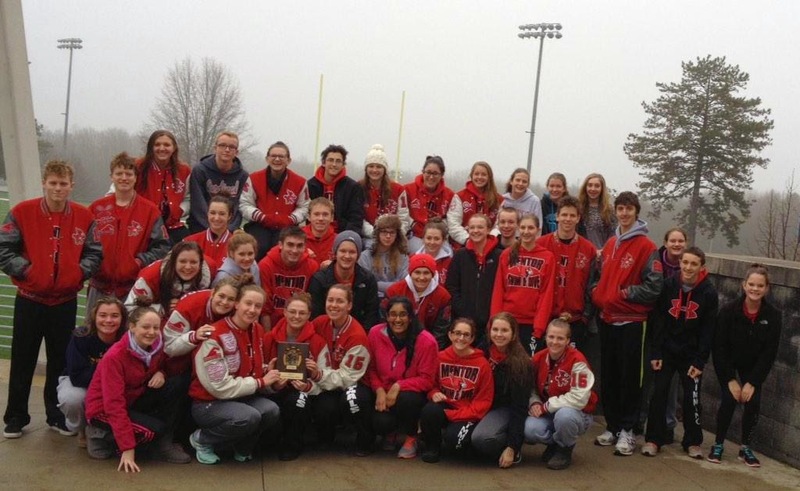 Mentor squads took home the combined team title and the girls outright win with scores of 1320.5 and 869.5 respectively. Boys squad picked up a third place finish with a score of 451. Some great swims in an older pool. Thank you to all the parents who came out to support! Squads will be back in action this coming Friday Dec 19th at Spire against Cuyahoga Falls. Meet starts at 6:30pm. Hope to see you there! Hiram Invitational tomorrow. Bus leaves at 7am and meet starts at 10am. Swimmers bring a blanket to sit on. Parents 5$ for admission. Get some rest tonight and lets go cards! Mentor squads posted great times but came up short against Brunswick last night. Girls team lost 105-78. Boys team lost 108-75. Senior Adam DallaRiva broke the school diving record with a score of 264.45. This broke the previous record of 249.60 that he set earlier in the week. 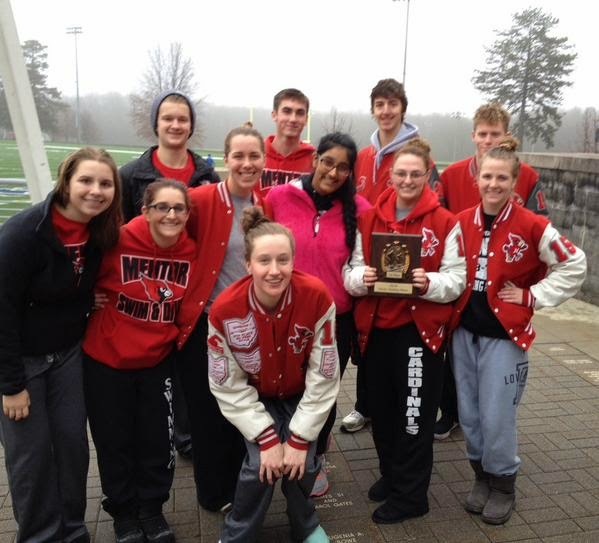 The Mentor squads will next be in action on Saturday Dec 13th at the Hiram Invitational. 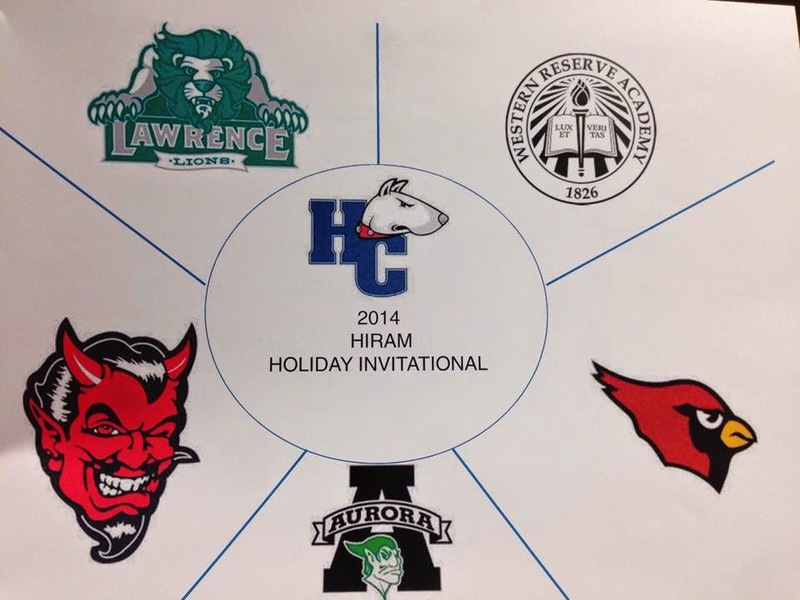 They will face teams from Aurora, Crestwood, Lawrence, and Western Reserve. The Meet will start at 10am. Also please note that winter break practice times have been updated as all teams have finalized space at Spire. Several of our practices over break have moved to 9:30am-11:30am. Please check the practice schedule. Thanks! Some excellent swims last night in our first meet of the season. Girls took home the win with a score of 118 to 68. Guys had some excellent races against a tough Twinsburg squad but came up short 105-75. Senior Adam DallaRiva broke the boys diving record with a score of 249.60. This beat the previous mark of 224.40 set by B. Harden in 2010. Great job Adam! Reminder that we have a pasta dinner tonight after practice at Jenna Wallace's house. Meet tomorrow against Brunswick High School starting at 6:30pm. Be ready for the bus in the gym lobby at 4:45pm tomorrow. We will still be having practice Saturday Morning from 8-9:30am at Spire. The bus will leave at 7:45am. Pay to play must be submitted in order to swim in any meet. This can be paid on the same website as student lunch accounts. Please get this done as soon as possible for our first meet on Wednesday! The hardest part of the season is complete as we transition to competition and our first meets. We will take pictures before we leave for the meet on Wed 12/3. Pictures will begin at 3:10pm. Great opportunity to not only dress up for our first meet but also for pictures! That means a tie gentlemen! Entries for the 40th Viking Invitational held at Cleveland State are coming due soon. This is one of the fastest high school meets in not just Ohio but the entire midwest. Cut times are used for entry into each event. As a result, and as is the case for every team, not every swimmer will be able to participate in this meet. Coaches will be meeting with swimmers that have the cut times in the next few practices to determine events. If you have any questions please let me know. I included the cut times from the meet file below incase anyone wanted to check. Practice and our team pasta party will be cancelled today (11/14/2014) because of the weather conditions and the school district being closed. Practice is scheduled for tomorrow at the HS (8am to 9:30am) because Spire will be closed for a swim meet. We will meet in first floor A wing; wear tennis shoes. We will be running and doing some crunches, pushups, and other core exercises. Spirit Wear orders will be due tomorrow for anyone that still needs to turn them in. Enjoy the snow day and we hope to see you tomorrow! Sorry for the late notice, just received word that all after school activities are cancelled. There will be no swim team practice tonight Nov 13th because of the weather. Pictures also are cancelled and will be rescheduled by the athletic department. We do still plan to have practice tomorrow at our normal time (bus leaves 3:15pm). Practice Saturday is from 8-9:30am at the high school, meet in A wing. If weather impacts those practices I will send an additional email update and post it on the team website. Thank you for your understanding and get home safe! A few reminders for this week. The district winter sports information meeting will be Tuesday Nov 11th at 7pm in the Fine Arts Center. This is a district wide (grades 7-12) meeting for all winter sports hosted by the athletic department. Team pictures will be taken Thursday Nov 13th before practice. Swimmers will dress up for team pictures. We will meet in the gym lobby, take pictures, and then leave for practice. Individual pictures will be taken at practice at a later date. Final reminder that all suit orders need to be placed today. Suits are the only required item. We will have generic caps to sell at a later time if you do not want to purchase the custom caps with your name on them. Design logo for our swim caps has come in. If you have swimmer name added, it will replace the MENTOR underneath the cardinal. Reminder that the sizing set for warmups will be at practice through Monday. Suit (required) and warmup (optional) orders are due online by the end of the day Monday. If you have yet to place those, please do so. There is a step by step order guide and video to help with orders in the post from Nov 5th titled Team Online Store - Suit Orders. Thanks and see you at practice Monday! Welcome to swim season 2014-2015. Here is some insperartion for the first official practice tomorrow afternoon! Lets make it a good one! Our team online store has opened for suits, caps, and warm-ups. Please remember that you must purchase a team swim suit. 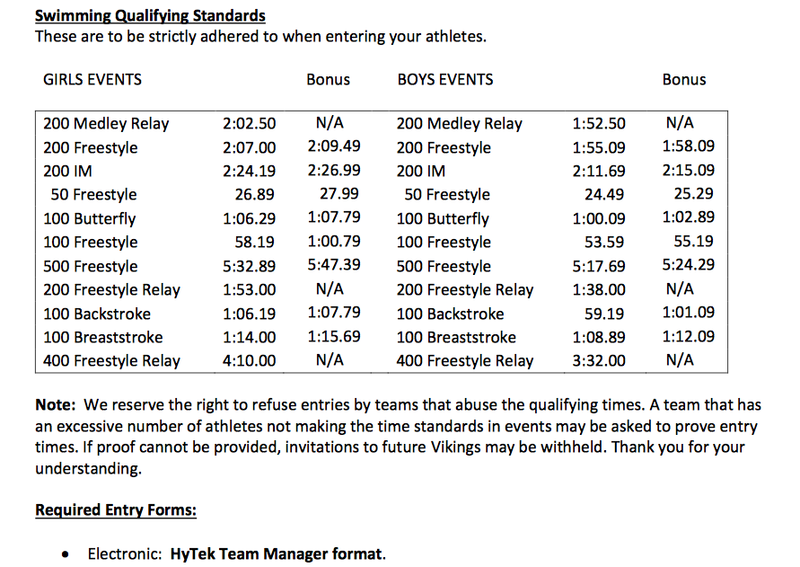 (OHSAA rules - disqualified for not having a team suit). I have included a step by step guide below for those that are more familiar with online shopping. If online orders are new for you, I created a video walkthrough that is more detailed. At this time we would like all orders placed by the end of Monday Nov 10th to ensure that we receive them by our first meet at Twinsburg on Dec 3rd. Please set all shipping to group ship so that it comes to the high school athletic office for free. If you have any questions about the order process you can contact any pureblueswim sales rep (952-935-6101) or myself for help. Just wanted to send out some updated information from the Lane Line Club. Thank you to all of the parents who signed up to help with timing! We had a great response to that. If anyone has taken and sold the All Around Town Books, please send in $28 per book sold. You can give it to Coach Kelly, or David Boltz. Please try to have this money or the unsold books returned to me by November 7. If you are purchasing a Cardinal bag and/or a T-shirt for parents, (order form attached) those orders, with payment (checks payable to Lane Line Club), get sent to the DallaRiva family through Adam or Noah, or they can be given to Coach Kelly. When sending in payment via the kids, I would prefer that you write a check (payable to Lane Line Club) so that my son David, or the DallaRiva boys are not carrying a large amount of cash on them. We still have several openings for helping / hosting a Team Pasta Party (sign up sheet attached). These team pasta dinners are held each week, mostly on a Thursday evening before a Friday meet. They are a great team building function. If you have not yet signed up and you are able to host these dinners, or at least help out, please email me back with the dates that you can help/host. The entire team, approx. 48-50 athletes benefit from these dinners and enjoy them, so we need all families to participate. They are a lot of fun to host! The kids are great and very appreciative of our efforts. If you can even sign up to just drop off a case of water or one item, that would really help out. Don’t forget to RSVP for the family Welcome Back Dinner on November 14 (see attached). Please either email me back or return your RSVP form to David Boltz during open swim prior to November 7. All families of Seniors and Juniors are asked to bring a dessert to share that night. We will hold Senior Night on Friday, January 30 which is our last home meet at SPIRE. Committee Co-Chairs Bonnie Lingafelter and May Ann DallaRiva are asking any parent of a Senior to help on this committee. If you are interested, and have not yet signed up, please email me back. Hope everyone has a great first week back in the pool!! Hope everyone is having a nice weekend. Quick update for next week. The bus will leave MHS for open swims at 3:15pm this Monday through Thursday. We should return by 7:00pm. Please plan to have your ride there no later than 7:00pm. The bus pickup/dropoff will take place in the North lot next to the gym. Swimmers can meet in the gym lobby just outside of the athletic office. Our first regular season practice will be Friday Nov 7th; time, bus pickup/dropoff, and our meeting place will remain the same. We will have two buses for all regular season practices and meets. For divers, Coach Lauren Caimi will be at open swim Monday and then at regular season practices starting Friday. There will be open lanes for diving each day during open swims. Please remember that forms including physical, emergency medical, and concussion must be turned in to myself or the athletic office in order to participate in the first regular season practice. If you have already completed your physical and concussion forms for another sport, those will carry over for one full year. We will however need a new copy of your emergency medical because these stay with each team head coach. Participation fees must all be paid online through the athletic office (not the head coach). Fees are not due until mid November and I will send a few reminders as we get closer. If you have questions about the fees or forms, please contact the athletic office directly. The team online order page will open this week for our team suits. I will send a separate email with instructions when it becomes available. They are still updating a few final changes and including pictures of the items. We will have our own team page off of pureblueswim.com. Please remember that information and our schedule can always be found at mentorswimming.blogspot.com. This will be updated throughout the season. If you have any questions please let me know.